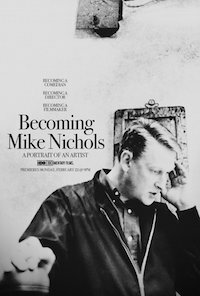 A compilation of discussions between director Mike Nichols (1931-2014) and his colleague Jack O'Brien includes the former's recollections of his early career in show business, including his comedy performances with Elaine May in the late 1950s; stage directions of "Barefoot in the Park" (1963) and "The Odd Couple" (1965); and making the films "Who's Afraid of Virginia Woolf?" (1966) and "The Graduate" (1967). The interviews were filmed at the Golden Theatre in New York City in July 2014.